Governors of 19 Northern States have risen from their meeting in Kaduna Friday, condemning labelling perpetrators of crimes around the country as Fulani people. The Governors who met behind closed doors said, as much as they condemn the recent attacks in Enugu and other parts of the country, they condemned labelling the criminals as Fulani people. Briefing newsmen shortly after the meeting at the Kaduna Government House Friday evening, Chairman of the Northern States Governors Forum (NSGF) and Governor of Borno State, Alhaji Kashim Shettima said, it is an insult to label criminals as Fulani. According to him, 'We want to unequivocally condemn the recent killings in Enugu and other parts of the country. But we equally condemn the politicisation or permit me, the 'ethinicisation' of the whole crisis. It goes beyond Fulani. If anything happens, they say Fulani herdsmen; to me it is an insult. 'Kidnapping in this country originated in the South-east, were they called Igbo kidnappers? We have a great national challenge and we want to call on all and sundry to come and let us solve our common challenges as a people. Because the blood of paternity that binds us together supersedes whatever differences that might divide us,' he stressed. While he condemned the Agatu killings, the NSGF Chairman, charged the media to avoid sensationalism and harp on issues that bind the country Nigerians together. 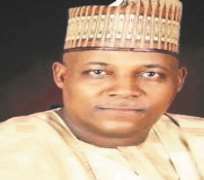 On the legacies of the Premier of Northern Nigeria, Sir Ahmadu Bello, Governor Shettima said they were doing everything possible to revive the New Nigerian Newspapers and Arewa Textile Limited. Earlier, in his opening remarks, the NSGF Chairman confirmed that Boko Haram insurgents that have been terrorising the North-east in the last five years have been degraded. He was however quick to note that, there are still pockets of bombings in the North-east which has been ravaged by the insurgency for more than five years. The Governor also disclosed that, following their recent visit to the Islamic Development Bank, the bank has resolved to rebuild Northern Nigeria. With this development, the Governor is calling for the rebuild of destroyed communities as well as total rehabilitation of affected persons who are currently seeking refuge at different camps across the country. According to him, 'in respect of the insurgency in the North-east, I can confidently confirm that the insurgency has been irredeemably halted and the insurgents themselves completely subdued. 'What remains now are few isolated pockets of suicide bombings which the recalcitrant remnants of the insurgents use as a last resort to attract attention and create unnecessary panic among the general population,' he stressed. According to him, the meeting would also discussed extensively with a view to preferring solutions to grey areas the region is currently faced with which he said include insurgency, cattle rustling, clashes between farmers and cattle rearers, intermittent incidents of banditry and kidnapping as well as issue of New Nigerian Newspapers. The Forum's Chairman further added that the meeting will assess progress made by some committees set up in their September 2015 meeting with responsibility of coming up with workable recommendations. 'In the North West and North Central, the security situation is alarming as the issues of cattle rustling, kidnapping, banditry and the persistent conflict between farmers and cattle rearers are gradually assuming unacceptable proportions. 'It has therefore become a strategic imperative for us to take a hard look at these formidable challenges and work out strategies on the most effective ways of not only reversing the trend but also overcoming them once and for all. Whatever resolutions we can come up with would be communicated to the appropriate authorities for obvious analytical examination and possible implementation,' he added. He then thanked President Buhari, gallant Military and other security agencies for fulfilling promise to bring the insurgency to a complete halt. 'This undoubtedly entails the reconstruction and rehabilitation of public institutions and structures such as Local Government Secretariats, Police Stations, Prisons, Hospitals and Clinics as well as schools, all of which were either partially or completely destroyed by the insurgents,' he said. On the Islamic Development Bank's plan, Governor Shetima said, 'in our determined efforts to address these challenges in collaborative partnership with the Islamic Development Bank. You may recall that consequent upon a deliberate resolution of the Forum, I had the privilege to lead a top level delegation to the Headquarters of the Islamic Development Bank in Jedda Saudi Arabia, for special consultations with the management of the Bank on possible ways of attracting their assistance in addressing some of the core challenges we, as a region, are facing. 'The delegation included Their Excellencies the Executive Governors of Jigawa, Kaduna, Kano and Nasarawa States as well as top officials of the NNDC, some professional consultants and other relevant stakeholders and senior officials. In reaction to our various presentations, the Bank's President, Dr Mohammed Ali had given us a strong indication of the IDB's declared intention to initiate a comprehensive and constructive plan for the reconstruction of the Northern Region. 'This, according to him, entails possible intervention of the Bank in human capital development, Agriculture, poverty alleviation and improvement of infrastructural facilities, among others. The Consultant's Committee was formed to specifically articulate our priority needs in a manner that could easily facilitate the intervention of the Bank in an all-encompassing and implementable way and present them to the IDB. 'I wish to reiterate here that in seeking the intervention of the Bank, we have not violated any law of the land. As I had indicated in another forum, we knew our statutory obligations at every stage of the process; which was why we had in our delegation a senior official of the Federal Ministry of Finance, who is in charge of the IDB desk, to monitor the proceedings and guide us, if need be, to ensure that everything was done in accordance with the statutory requirements guiding foreign assistance,' he said. - The Nation.